Based in Hedge End, Southampton and established in 2010, R&A Removals offers a wide range of professional removal services to commercial and domestic customers across Southampton and the whole of Hampshire, delivering to anywhere in the UK or internationally. Our experienced, expert team takes every care to ensure a smooth, safe and efficient moving experience that meets the highest expectations from start to finish. We’ve built an excellent reputation in and around Southampton and beyond, treating all customers with fairness and without discrimination. For this reason, we come highly recommended by everyone – from student moves to OAP’s, including by the local LGBTQ community. Cash, cheque, chip & pin machine, bank transfers and all major cards accepted. R&A Removals offers a wide range of professional and fully insured services, tailored to your needs. Our uniformed staff can take full control of dismantling, packing and reassembly if you wish, with all materials, including blankets, straps and furniture covers provided by us. 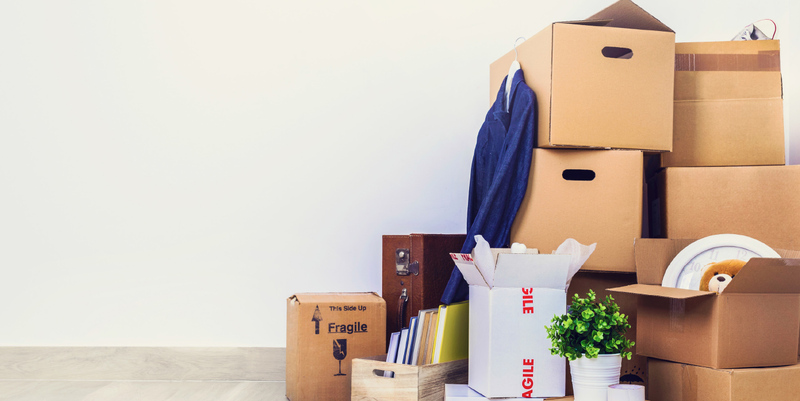 Whether you’re a first time buyer, moving to a bigger or smaller property or relocating across the street or from the south to another part of the UK, R&A Removals will make your house move a smooth and stress free experience. We can even move you across Europe, or arrange international relocations around the world. We make moving day simple, packing up your treasured possessions with care and efficiency using all our own packing materials. We can even arrange for them to be put into short or long term storage if you need us to. There’s no need for you to worry about a thing. If you’re looking for a Southampton-based commercial removal company, look no further than R&A Removals for professional moving services, tailored to your needs. Whatever your business, we can plan and undertake a seamless premises or office move with minimal disruption to your staff, customers or operations. We can organise a full packing service, including furniture dismantling and reassembly, out of hours during weekends and evenings if required – all fully insured, and overseen throughout by our senior management for total accountability. Need a man with a van in Southampton or the south of Hampshire? R&A Removals provides a straightforward, affordable, no-nonsense service, with our 3.5 tonne lorry and a driver with over 30 years experience and a Class 1 HGV licence. We can provide the service you need to get the job done, whatever you need to move, wherever you need it moved to! Are you buying or selling online on Freeads, Gumtree or ebay? 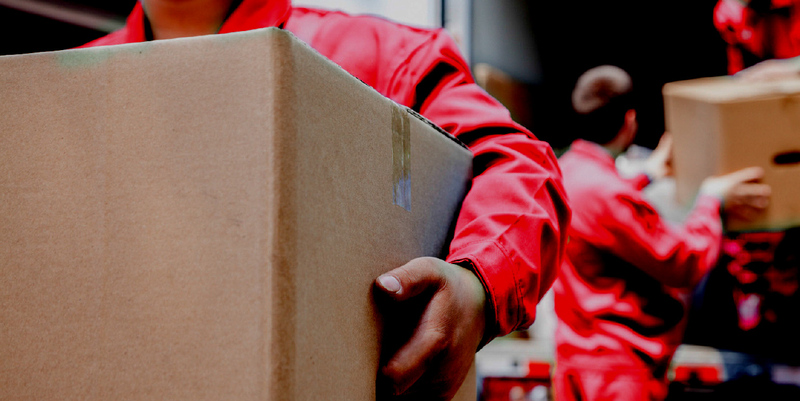 We can organise collection or delivery of your bought or sold goods to or from anywhere in the UK, reliably and more competitively than you might expect. Take the hassle out of buying and selling with our delivery services. We’ll pack fragile items, deliver on time with care and complete any paperwork at each end to complete your records and keep your ratings high. We perform prompt and efficient full or part house clearance services for individuals, landlords or estate agents/letting agents, including sheds, garage or loft/attic clearances where required. Our experienced and knowledgeable staff appreciate the need for sensitivity where there has been a bereavement. Our services are environmentally friendly, we recycle where possible and are licensed to carry waste and dispose of it in accordance with environmental guidelines, Environment Agency registered CBBDU152590. If short or long term storage would make your move easier, R&A Removals can arrange a safe, secure and cost-effective solution in the best location to suit you. 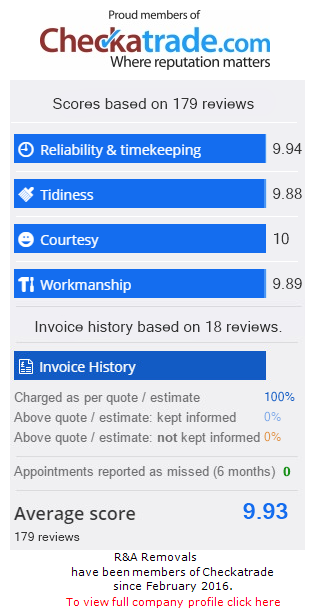 Roy and his team were very efficient, courteous and hard working. I only called him on the Saturday and he fitted in my removal the following day. He also did an additional drop off without any fuss at all. This job was completed, despite large items of furniture having to be negotiated through small door-frames, in record time and with minimal fuss. Despite working through driving rain and high winds, a great sense of humour prevailed, making what can be an unpleasant task into light entertainment I would not hesitate to recommend this company, whose charges were surprisingly reasonable. Punctual and efficient cheerful and very helpful, a good two man team. Helped make it a less stressful day. Would certainly recommend.